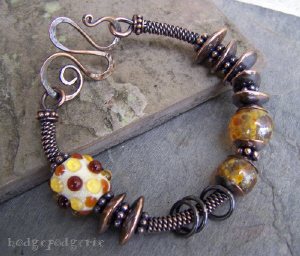 On a heavy gauge solid copper wire core, Mykonos Greek ceramic beads that have been dipped in pure copper and amber-hued artisan lampwork beads provide an interesting contrast of light and texture. Solid jump rings provide a bit of movement while a dark rich patina brings out the warmth of the copper and highlights this bracelet's richly textured design. 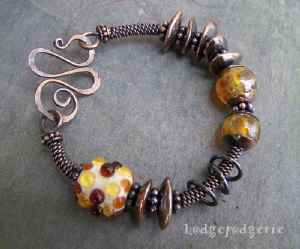 A handmade hammered wiredoodle clasp further enhances its unique handcrafted look. Available for purchase in my handcrafted jewelry store. 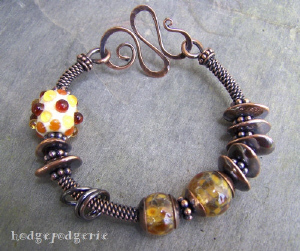 Return from "Autumn Sunlight Bangle" page to "Bangle Gallery" page.